There’s something seductively subtle about Eastern European flavors. No one is going to knock you over your head with cumin or turn the garlic up to 11. Instead, here’s some sauteed onion, and a little dill. I think of these sorts of brothy soups as babushka soups, grandma soups. You should be able to experience each ingredient; the sweet earthiness of the carrot, the toothsome bites of cabbage, the succulence of the chickpea, the substance of the rice. Simple, comforting flavors that are easy to love. I like to use homemade broth here, but if you have a broth you really love then go ahead and use it, I can’t stop you. I also dig the floral notes from jasmine or basmati rice, but you can use whatever rice you like. Just remember that brown rice has a longer cooking time. I also love the ease and the look or baby carrots, I just leave them whole if they are small enough, or slice fatter ones lengthwise on a diagonal. Preheat a stock pot over medium heat. Saute onion in olive oil with a pinch of salt for about 5 minutes, until translucent. Add garlic, thyme, salt and pepper and saute a minute more. Add rice, carrots and cabbage and then pour in the broth. Cover and bring to a boil. Once boiling, bring down to a simmer, add the chickpeas, and let cook for about 15 more minutes, until rice is cooked and carrot is tender. Stir in the dill and season with salt and pepper to taste. This definitely tastes better the longer you let it sit, but it can be enjoyed right away, too. Top with extra fresh dill. Yum..this looks like my kind of soup. Healthy and hearty. Thank you. umm…In my mouth now please! It’s so lovely – and very inspiring too. oooh, This would work crazy fast in the pressure cooker. I going to try it…NOW! The house where I am currently kitty-sitting has those exact same bowls. These cats dine in style. This recipe looks perfect for this weather, and so cheap, which is necessary. Thanks for sharing! I love those bowls… they look like they were made for the soup. Great, simple , comforting soup. I love using cabbage in soup. Made this tonight… delicious! Really flavorful and satisfying. I doubled the recipe, as for some reason it didn’t seem like the recipe would make much. Ha! I’ve got so much soup now! Good thing it’s so tasty. I made this for dinner tonight and it is sooooo good! Thank you! I made this for dinner last night-my hubby doesn’t like cabbage, so I used mushrooms and a little extra dill because I LOVE fresh dill and is was AWESOME! Thanks for posting this one! Oh so amazing! I was out of thyme so I used a lil tarragon and oregano. Yummm!!! Love this… made it twice this week.. so freaking good! Made this for a Christmas Eve dinner treat, and it was fantabulously good. Just very simple, savory and comforting soup for a snowy winter night. Next time I’m making a double batch! Delish! Just right! Perfect Jewish grrl’s Christmas eve dinner! Yum- made this for the weekend. Mellow flavor with a light dilly taste. I squeezed fresh lemon juice into each bowl before serving- really heightened the flavors. I also added nooch to enhance the broth flavor. Lots of fresh black pepper + more cabbage = lottsa love. So easy – my husband made this for me and was ready by the time I got home from work. A husband-proof recipe *and* delicious! What more can you want? Well thank you very much! I just made this soup and it came out sooooo yummy! I’m topped it with some cilantro & a squeeze of lemon juice. Made this recipe today before work, and boy was it de-li-cious 🙂 Thank you very much! I added too much rice so now it’s more of a “stew” but yummy just the same! There’s nothing better than a steaming bowl of soup on a cold, snowy day. I could eat soup every day of the long winter season here in Minnesota. This recipe looks just perfect and the best part is that just about everything in it is probably in everyone’s pantry or fridge! 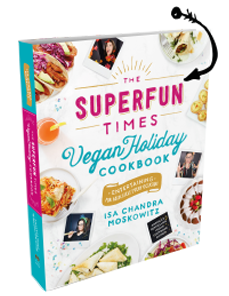 I’ve just discovered your blog but I’ve been a fan ever since I bought your cookbook Vegan Brunch! This is a yummy, cheap, userfriendly dish that is perfect for winter nights. That said, it may be a little salty if you’re sensitive to salt. I made this dish for big group of friends, and while most people loved it, I and one other guest found it was more salty than we like (and I made it with dried chickpeas with no salt added). I will definitely make the dish again, but next time will omit the 2 tsps of salt and add salt to taste instead and use a low sodium broth. Oh yes, always use less salt when doubling stews. I guess because of the liquid cooking down and concentrating? Thank you! I didn’t know that, but will definitely do that going forward. This soup is so friggen good, that I’m making more tonight!!! YAY! planning on making this soup. can you use dried dill instead of fresh? if so, how much? thanks! Yeah, you can use dried. The taste won’t be all fresh (obviously) but start with 2 teaspoons and see from there. I made this tonight and wasn’t really sure what to expect. I totally love it. I gave my little girls (4 and 1) a taste and they wanted to eat it immediately. Unfortunately I didn’t have any dill so I can only imagine how much better it would have tasted. I can’t wait until my husband comes home to try it. He loves cabbage. Thank you for such a wonderfully simple and tasty recipe. Oh my goodness, I wish I had a cup of this right now. Definitely going on my winter cooking list! I made this when I had family in town for the Holidays, and it was a huge hit! And I swear it got better over the next couple of days. Thank you so much for sharing it. This is definitely going in my ‘to make over and over’ pile. Hi Isa: Just want to tell you I got “Appetite for Reduction” for Christmas. I love it. This soup sounds good and very grasnmotherly. It is now minus 17 degrees Centigrade in Southern Ontario. This soup is definetly on the menu today. I’m an evolving vegan. Decision made June 2010. Had spme slips but slowly feeling better. Next the weight loss. I enjoy learning about veganism, your new book is certainly going to help. After realizing I had every single ingredient in my pantry I tried this out last night. It was absolutely wonderful! Next time I will have to double the recipe so I’ll have some leftover! 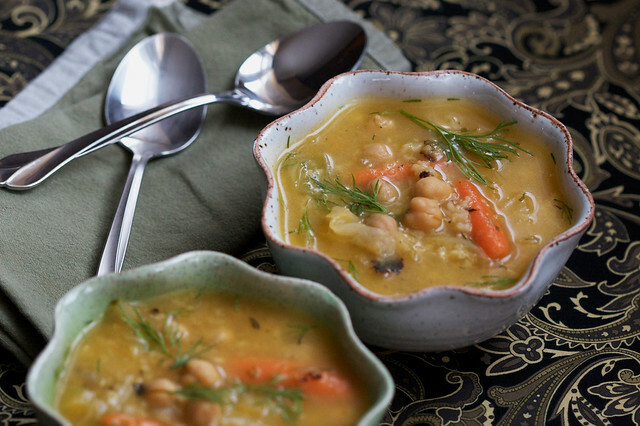 Perfect winter time soup to make in a pinch. I think I added a few too many veggies so it came out as more of a stew, but this recipe was still soo tasty. Definitely a go-to if you’re in the mood for something homey that will warm you right up. This is delicious! I made this for dinner tonight and served it with lemon juice and fresh cracked pepper on the side (the extra zip from a dash of lemon makes it even more perfect and adds to the Eastern European flavour). The jasmine rice was replaced with already cooked brown for extra convenience and a whole grain boost. I will definitely be making this again! Absolutely delicious! Fresh dill is a must! For the broth, I used 6 cups of water and 2 cubes of Rapunzel organic vegetable bouillon with sea salt and herbs, and salted to taste. Reminded me of matzo ball soup (dill and carrots). Made this soup today and love it! Really reminds me of the type of soup you get in Poland. Thank you! Very yummy. We love this soup and it is sitting on my counter in the crockpot right now. I use brown jasmine rice and I keep everything on hand anyway except the fresh dill. One of my many favs. I made the rice separate, as I always get a mushfest with rice in soup, and added potatoes. Lovely! I made this using water instead of broth (because I didn’t have any broth) and without using oil (for religious fasting reasons). I also cut the amount of thyme in half and used generous amounts of dried dill instead of fresh dill. Even with all those changes, it is just fantastic! Last week I had some extra dill from making matzoh ball soup (VWAV) and luckily found this recipe. It was so good – I couldn’t stop eating it. Mine turned out kind of like stew after it sat for a little while but I think that’s because I stirred too much after adding the jasmine rice. I find that when I stir jasmine rice more than once it gets mushy on me. Also, the soup is just as amazing without the dill. I tasted the soup when it was almost done and it was so good I would have forgot to add the dill if it wasn’t already sitting on the cutting board. I just made this for lunch and am eating it right now, lol. And I got to say this is the BOMB! SOOOOO DELICIOUS!!! Thank you!! So, I decided to get serious about eating vegan, and purchased 2 of Isa’s cookbooks on Amazon because of the great reviews. I couldn’t wait til they were delivered so stopped by this website and picked 2 recipes at random to try. This soup was the first (perfect for a chilly Winter’s night) and also made the Quinoa Salad with Black Beans and Mangos. OMG, Isa, you are one talented and creative chef. These dishes were both amazingly fantastically scrumptious. And since I chose these randomly I am certain the others will be just as excellent. Thank you, thank you, thank you. It’s delicious! It reminds me of soups that my Polish grandma made: Put everything you have in the fridge to a pot, boil, add some spices and.. dinner’s ready – and super tasty! Thanks for the recipe! Baby carrots are not your friend. Buy carrots from your local farmer and cut them yourself. lazy. One of my clients just tried this and LOVED it! Thanks for posting such delicious and informative recipes! Great, simple, cheap and DELICIOUS recipe! it turned out funny looking because I only had red cabbage and the whole broth and rice turned purple. Loved it, Thank you genius lady! I made this as an antedote to the Thanksgiving rich food leftovers and because it has turned seriously cold in Tennessee. This was perfect. I couldn’t find fresh dill (even at Whole Foods) so I used dried. We made this soup today and it was wonderful. It helped lift our spirits as our hearts wept for the lost souls at Sandy Hook Elementary School today. Just ate for dinner – DELICIOUS! This is my favourite go to stew. I add some curry powder for extra richness. It was one of the first vegan dishes I made. Lately I’ve been experimenting with new recipes, they haven’t turned out as satisfying as the pictures on the websites … back to the basics – this stew! do you think this would be good with quinoa or couscous in place of the rice? This is my favorite soup ever! This looks beyond delicious. I think I’ll make it this weekend! I can’t keep my fork out of this soup pot! The dill just gives it this extra interesting twist that I keep coming back for. Mmmmmmmm. I’m part if a dinner club where once a week I cook for three families including my own (and two days I don’t cook, but food magically appears on my doorstep!) When I’m in a pinch for a recipe I always know I can come here and find one that will be yummy without fail! Thank you so much for doing what you do and sharing these amazing creations!! Greetings from Australia! I think I could make a special trip to the US just to eat at your restaurant. I have made this 6 times recently and I can’t seem to get enough. It’s like soup crack for my body. Made this soup today…delicious! Added 1 TBSP lemon juice after removing soup from heat. Also, I had only fine, dry dill on hand so I only added 1 tsp. Lastly, I used my hand held blender to puree some of the soup to make it more like a stew. Serving with a dense, whole wheat bread boule and a salad.! This soup might be the ultimate comfort food. Warms my heart every single time. I love this soup as do my two boys age 2 and 6! I always add a couple cups extra of broth and extra dill, so good! Thank you so much, Isa! The soup was fantastic! I used brown rice so I cooked the soup longer and added more water. I didn’t use vegetable broth. I never do in any recipe. I just use water – the soup was still very flavorful! I also add extra salt to taste. I did not use baby carrots. I used 4 large carrots. I also added in a diced red bell pepper in with the onions to add color. I added in 3T of lemon juice at the end and let the soup simmer for 15 minutes. I added in extra dill maybe an extra 2-3T. I would say the soup serves 5-6 people. Fantastic, cant’t wait to try it! We loved this! We put loads of dill in the soup while it was cooking and more fresh dill when we served it. Probably will add even more carrots next time. They were so good in it. We did let it sit for about 2 hours in the pot with the lid on. Was fantastic! And celebrate Christmas, Hanukkah, and everything else with Jelly Doughnuts, Candy Cane Fudge Cookies, and so much more.